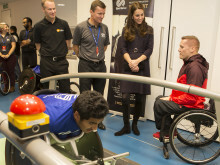 The Duchess of Cambridge’s work with aspiring athletes was praised by some of the biggest names in British sport today at a SportsAid reception she attended at SSE’s Home Nation House during her visit to the Glasgow 2014 Commonwealth Games. Alongside Aled Davies, Keri-anne Payne, Steve Parry, James Hickman and Sally Brown, Robson was one of six SportsAid ambassadors at the event who were there to share their experiences with 15 SportsAid athletes who hope to follow in their footsteps. Team Wales captain Aled Davies met the Duchess for the second time today – the first being when she presented him with his gold medal at London 2012 – and said her love and passion for sport is phenomenal. “It’s great to have her as the Patron of SportsAid, and you can see how much she loves it,” he said. Another SportsAid athlete at the reception was 15-year-old swimmer Thomas Hamer from Lancashire who on Saturday set a new British record at Glasgow 2014 to win a silver medal in the S14 200m freestyle. “It’s been an amazing experience in Glasgow I never thought even six months ago that I’d be here. The people and the atmosphere have been fantastic. I was over the moon to win the silver medal on Saturday and get the British record. That’s what I wanted, the British record. I’m really pleased with my swim. Both Rachael and Thomas have been supported by SSE this year as part of its Next Generation programme which is run in partnership with SportsAid to help young people with big ambitions in sport. Speaking to an audience of SportsAid supporters towards the end of the reception, Olympic bronze medallist Steve Parry expressed his excitement for the future of British sport. “The direction of travel is utterly brilliant. In 1996 we won one Olympic gold medal and now we are pound for pound the best Olympic sporting nation on the planet. And here in Glasgow, when you add up all the medals for England, Wales, Scotland and Northern Ireland we trounce Australia. Sport has never been in a better place in this country. We have fantastic role models like the people we see here today and it’s fantastic to see kids getting into it at the grassroots. 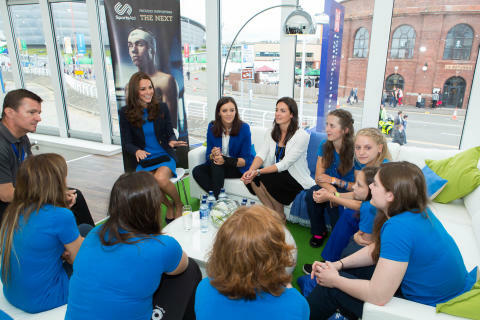 Photo caption: Her Royal Highness the Duchess of Cambridge meets SportsAid athletes and ambassadors at the charity's reception in Glasgow today during her visit to the Commonwealth Games.